Buy the Farm . 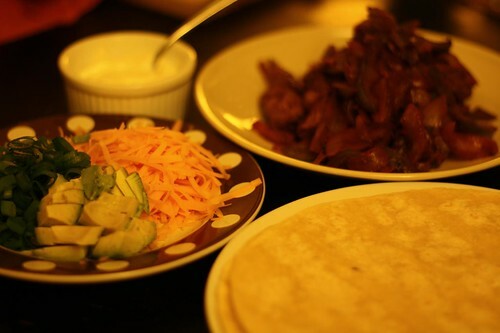 . . Share: Fajita, Are We There Yet? Tonight I continued to spelunk my way through our cabinets to find new culinary treasures that we would be forces privileged to use for our dinner! For salad I cleaned up some mustard greens and tossed it together with the leftover iceberg lettuce. 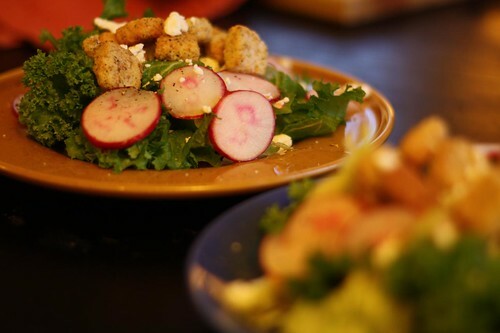 I topped it with sliced radishes, croutons, feta cheese, salt, pepper, olive oil, and lime juice. I had been hoping to use up this fajita sauce from Fajita Joe's after rediscovering it in the cabinet this weekend. Rediscovering things in your cabinet is kind of like rediscovering albums you'd forgotten about. The only difference is that sometimes when you rediscover them they are rotting and full of mold. I sauteed some onion, garlic, jalapenos and bell peppers with a little salt and pepper then added the fajita sauce and some slices of leftover skirt steak from last night that I thinly sliced. 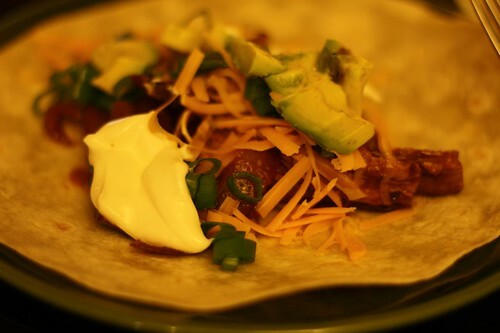 I served it with sour cream, avocado, green onion, and shredded cheddar cheese. I wish that I had one of those hot plates that I could have left in the oven and then taken to the dinner table so the fajita toppings were sizzling when I served them. I feel that it really would have classed this dinner up like we were in a fine-dining establishment like a Chili's or an Applebee's. Last night I established that I liked anything served in a small squat container. 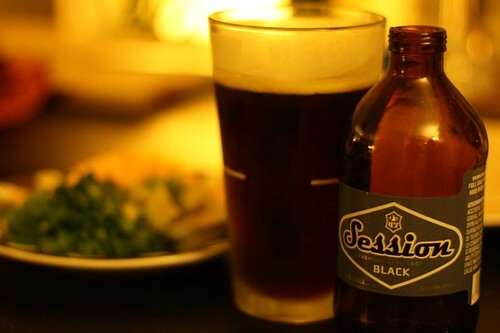 I proved this by having a Session lager (one of my least favorite types of beer) from Full Sail Brewing Co. Tonight I continued this trend by having their black lager. This one was not quite as good as the regular lager but a fairly decent accompaniment to fajitas. Now there is only one more lager left in the fridge that I have to work my way through. That story, I'm afraid, will have to wait until another day. Since it's from my least favorite drinking establishment in all the world (and it's my least favorite type of beer in the entire world) I'm in no rush to tackle it just yet. Eventually my time will be up, however, and I'll be forced to.